Our integrated design process balanced the advantages and trade-offs between systems, design, user comfort, and costs. Using multi-parameter energy modeling software (proprietary to Stantec), we quickly analyzed thousands of scenarios and their effects on construction and long-term operating costs. The Cora Group aspires to lead the sustainable world by building regenerative facilities that are economically viable and sustainable. 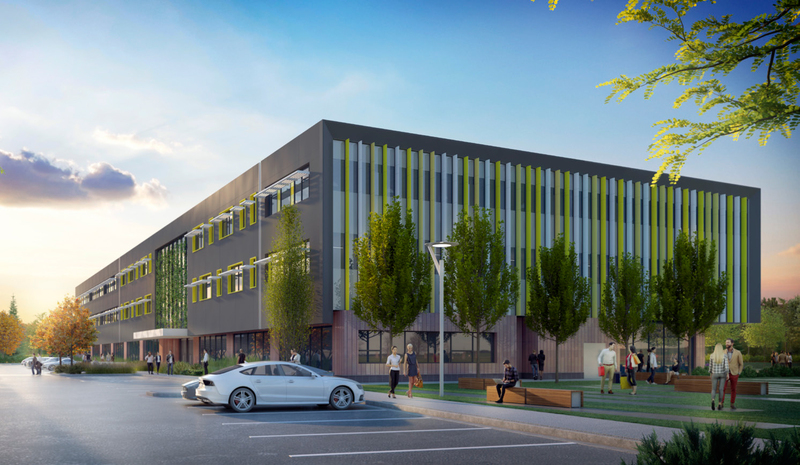 Stantec is designing this new multi-tenant commercial office building that targets LEED Platinum, aiming to generate more energy than it uses (net-positive energy) and follows the zero Carbon Framework for GHG emissions. 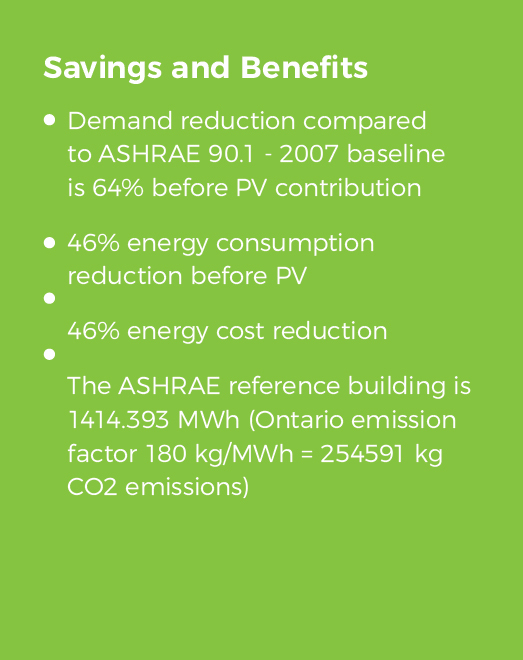 The inception of the project was a collaboration of work between the Cora Group, Sustainable Waterloo Region and University of Waterloo to create a replicable business case for deep green commercial office buildings in a Canadian climate. 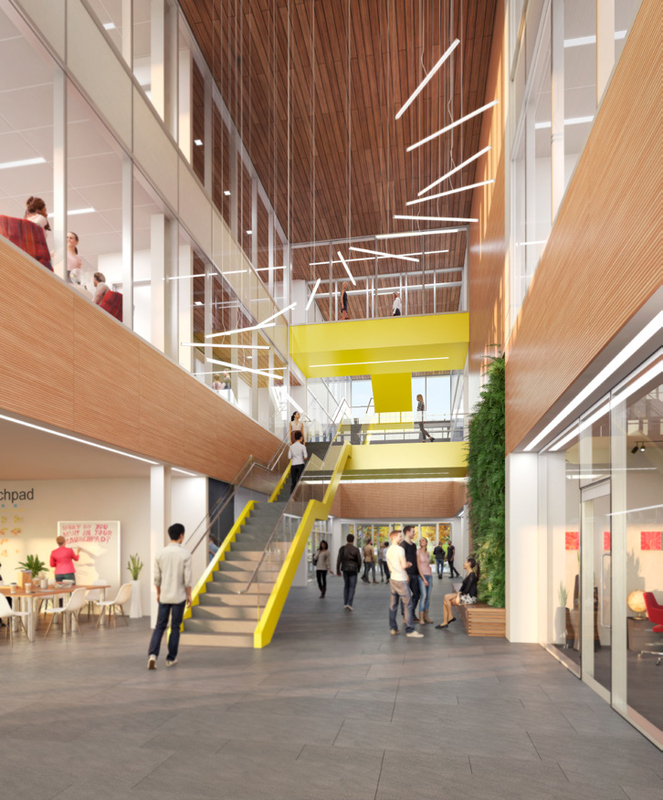 Stantec was engaged to prepare a feasibility study investigating the most leading edge technologies and systems, which resulted in the design of the project. 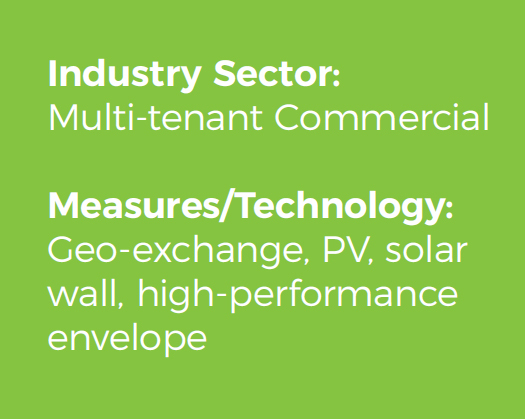 evolv1 incorporates a geo-exchange / VRF HVAC system, with a solar wall for preheated ventilation, rainwater harvesting for non-potable water use and reduction and a green wall for enhanced IAQ. The site hosts a combination of carport and roof mounted photovoltaics producing 700kW of electricity back to the grid, making it a net positive energy candidate. The building is currently on track to achieve LEED platinum certification. "It is our belief we’re going to be able to demonstrate to the industry that you can develop a net positive energy building without paying a significant premium." sought through the Green Municipal Fund. Sustainable Waterloo Region was essential in facilitating this process. The team is currently pursuing incentives with the local utility for energy savings. These incentives include demand saving incentives, and energy modelling incentives that are currently being worked out with the utility. The total project cost of the project is between $35-40 M.
technology with the cost to generate energy through PV, and relying on PV energy after the equilibrium point. The success of the building is determined by how citizens behave within it and how the space is utilized. As a central design concept, generating an internal community where users work together towards a larger goal is critical towards achieving Net Positive Energy. Sensitivity analysis on tenant types and uses allowed the team to take an aggressive but realistic approach to sizing the PV array. An integrated approach with the client, operations and designers was necessary to undertake this endeavor. Completion of the building’s core and shell components is targeted for July of 2018. Interior fit-up will follow with doors set to open later in 2018. The Cora Group is hoping to build a second project across the street from Evolv1.